Would you like a guided meditation that connects you to the wealth of your soul and all of its resources? Would you like to experience over and over again what it feels like to directly connect with the vastness of the divine and the gifts that await you? Do you long to embody your soul and its sense of eternal home base within you? Do you wish to know how to hold your experience with Spirit within you so you can truly live a heart and soul directed life? 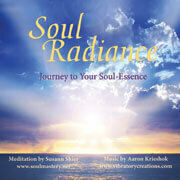 This guided meditation will take you on a profound journey to discover your Soul-Essence. Experience a deep connection with the wealth of your Soul bringing forth your life’s true fulfillment. Susann’s voice and the soothing soundscape provide a rich atmosphere to allow you to easily awaken all that your Soul gifts, strengths and purposes have to offer you. Deepen communication with your soul and engage wholeheartedly in a soul directed life.